A couple of pre-weekend posers, based on two uses of numbers that I saw tweeted today. They both show aspects of communicating with numbers that I cover in my workshops. (1) How many trees are there on Earth? (2) How long would it take to heat a cup of coffee by yelling at it? 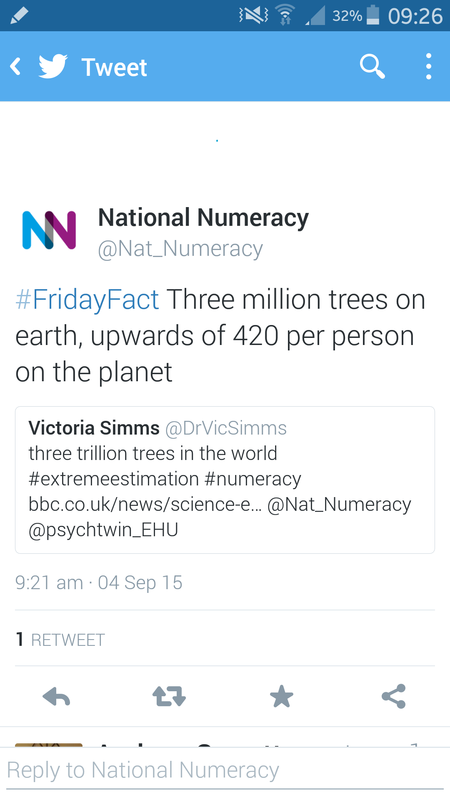 As you can see, National Numeracy had put million instead of trillion. To be fair to them, they owned up readily. And, I know it’s the kind of mistake I’ve made when busy or distracted. This happens a lot with the ‘-illions’ – big numbers all seem the same. That’s why in my workshops I cover how to sense-check numbers like this. Often this is about putting things on a human scale – in this case, knowing that there are 7 billion people on the planet should flag up that 3 million trees must be way too low. This seems to be an absurdly precise time, so I queried it. STFC says it comes a calculation set out on an American Physical Society website setting out that it would take 52,000,000 seconds and going on to convert that figure to years, months etc. First, the calculation uses approximations for some physical constants, and also rounds an answer to just two significant figures. In my workshops, I go over the problems of undue precision and the pernicious effect it has given that it’s human nature to think precise numbers are the right numbers (even when they are horrendously wrong). So always check your working and – if you must! – microwave your coffee. Next Next post: PR isn’t rocket science – or is it?